Marketplace’s Alisa Roth visits a new kind of payday lender that is part of an FDIC pilot program. The program gives payday loans — but it gives borrowers get personalized financial advice and more time to repay the loans. Kai Ryssdal: Most of the financial sector has bounced back from the credit crisis just fine. The big Wall Street banks, as you know, are making billions again. Smaller regional and community lenders are doing alright as well. But there is one part of the industry that got through the whole mess with barely a scratch. Payday lending has become a $42 billion-a-year business in this country. The profits happen largely on the back of interest rates that easily rise into the triple digits. Borrowers get stuck in a cycle of more borrowing, taking out loans to pay off loans. The Federal Deposit Insurance Corporation has been looking into alternatives to see whether banks can make those small loans profitable without crazy interest rates. Marketplace’s Alisa Roth visited one lower-cost lender in Wilmington, Del. Alisa Roth: Downtown Wilmington is full of shiny glass buildings that house dozens of banks and credit card companies. But drive west into the city’s poorer neighborhoods, and there’s an entirely different kind of financial institution. So you’ve got Easy Cash with the dollar sign in place of the “S.” You’ve got 123 Cash, again with the dollar sign in place of the S. So it’s two adjacent shopping centers. Easy Money AMG, I guess up the street we missed Deals on Wheels. Your job is your credit. On this stretch, every strip mall has one, if not two, payday lenders. Barbara Reed thinks desperate borrowers should have a new place to stop. She runs the financial management program at a nonprofit community organization called West End Neighborhood House. A couple years ago, she started noticing that a lot of people who came to her for help owed money to payday lenders. So she started looking for alternatives. Barbara Reed: We wanted the same-day cash, we wanted the quick easy turnaround. But we wanted something that was affordable, something that was safe. In other words, a payday loan. Just cheaper. 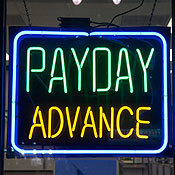 Payday lenders typically charge at least $20 for every $100 borrowed. Annual interest rates can go as high 500 percent. At West End, there’s no upfront fee. The interest rate is capped at 15 percent, and borrowers have three months to pay back the loan rather than the two weeks they get at most payday lenders. To do it, West End partnered with Wilmington Trust, which is a big, traditional bank. The community group does all the paperwork and approves the loans. The bank is the actual lender. Wilmington Trust is one of around 30 banks across the country that took part in a two-year FDIC pilot program for small, affordable loans. Doreen Conti: O.K., they’ve gotta put in their first and last name, address. Doreen Conti, one of the people who helps issue loans at West End, is showing the forms applicants have to fill out. Just like at a payday lender, all a borrower needs is an ID, a bank statement (to make sure they’re not overdrawn), a pay stub and a utility bill. But if payday lenders are strictly business — fast cash, no questions asked — West End wants to get personal. Applicants have to sit down with a counselor to go over their family budget. Here’s Barbara Reed, the director of the program, again. Reed: We want to look at your income, we want to look at your expenses. We want to help you see why you’re in this financial crisis. What are some things you could do differently to prevent this financial crisis? Marilyn Roman: They sit down and they show it to you in black and white. Marilyn Roman borrowed $500 from West End earlier this year. She says the budget counseling has helped her manage her money better. Roman: Then you see where your money is going. That’s what a lot of us don’t do, if we don’t see it in black and white, it doesn’t make sense. Like a lot of clients, Roman had used a payday lender before she came to West End. One time, it cost her $600 to pay back a $400 loan. So far, West End has loaned out $300,000 to people like Roman. The default rate is less than 8 percent, which is high compared to regular banks, but which the FDIC says it is roughly in line with default rates for unsecured personal loans and credit cards. Rae Ann Miller works for the FDIC. She’s convinced mainstream banks like Wilmington Trust can afford to offer alternatives to high-cost payday loans. They probably won’t be terribly profitable, but banks can use them to build new relationships in communities they serve. Rae Ann Miller: We’ve been conducting meetings around the country to try and promote the product, so hopefully more institutions will see that it can be done in a reasonable manner and a profitable manner. West End and Wilmington Trust are already replicating their program. Two other agencies now offer the loans and West End is negotiating with two more. In Wilmington, Del., I’m Alisa Roth for Marketplace.